Rico/Pretzel Logic appeared as a guest artist. The release date above is from csdb, though most of the reviewed cracks date to october and november, and it mentions upcoming parties in december - so a late december release seems a bit weird. 1 file, 80 blocks. 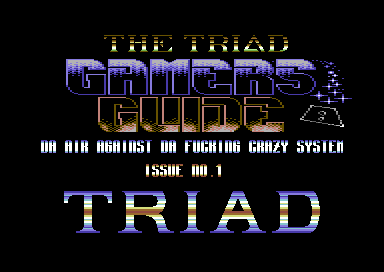 Games covered in this issue are (number of versions in parenthesis); Aidon the Apocalypse (3), Atomic Robo-Kid (4), Blazing Thunder (3), Dragon Breed (4), Dragon's Kingdom (11), Eswat (4), Golden Axe (3), Ironman Super Off Road (10), Monty Python's Flying Circus (12), Puzznic (6), Skatin' USA (11), The Spy Who Loved Me (14), Strider II (4), Summer Camp (2), UN Squadron (2), Yogi Bear And Friends (13) - a total of 16 games and 105 versions.